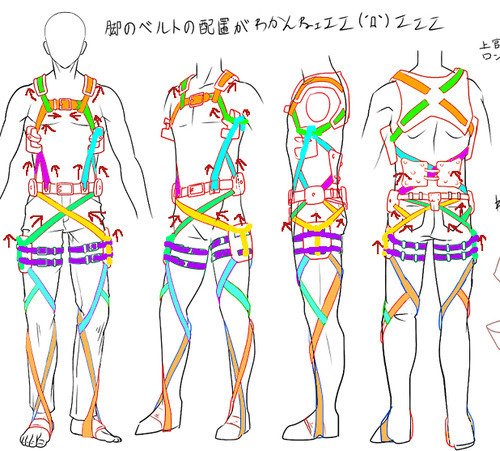 Recently I had bought the harness straps for an Attack on Titan cosplay. The thing is that when I got them, the directions are fully in Chinese and putting it together is rocket science without any help. Does anyone have tips if they have previously cosplayed? I have watched videos online, but it's not that easy to put something on while watching how to do so. Tips for using these belts! -Practice beforehand! These took me a whopping total of an hour to figure out the first time. I've worn them about six times now and I've gotten it down to about 20 minutes at the shortest. -Make adequate time to put on your belts the day of the con! Leave at least an hour if you're new to them. If you can, have someone help you! -If you can, sew on snaps! I can't stress this enough. Your belts WILL slide down throughout the day. It happens. No matter how much you tighten them till you feel like your leg might bruise, they will eventually end up sliding, and if you pull too hard, you can stress the material. The solution? Snaps. And by snaps I mean these things: http://tinyurl.com/nsgmjhp Basically you glue one side to the inside of the belt, and sew the other one to your pants, and then snap them together when you put them on, so your belts are connected to your pants. The more you put these on your belts, the better. The most key places I'd reccomend to put them are on the ones that wrap around your thighs, and right about your knees. Those slide the most. I hope this helps and have fun cosplaying Attack on Titan!